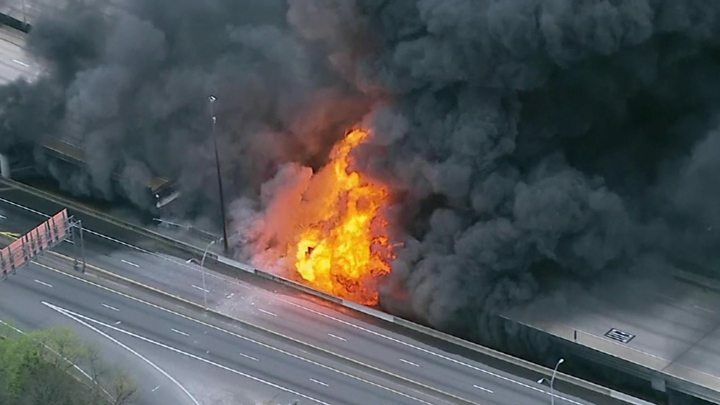 A huge fire broke out on an elevated highway in the US city of Atlanta on Thursday evening, causing a large section of it to collapse. Flames leapt several storeys high above the Interstate 85 highway before the collapse at 19:30 local time (23:30 GMT), reports said. Residents said they thought the sun had set early or a storm had arrived because of the thick black smoke. No one was injured and no cars were on the overpass when it fell. Police stopped traffic and turned cars away from the highway bridge just minutes before it collapsed, according to Atlanta Fire Department spokesman Sergeant Cortez Stafford. The fire caused widespread traffic jams and road closures, stranding many motorists for hours. Georgia Governor Nathan Deal declared a state of emergency in Fulton County, which covers most of the Atlanta area. It is unclear what caused the fire beneath the overpass, but the governor told reporters the fire appeared to be fuelled by a large pile of PVC piping stored under the structure. Georgia Transportation Commissioner Russell McMurry said the fire began in an area "as a storage location for construction materials, equipment and supplies. The site was a secured area containing materials such as PVC piping, which is a stable, non-combustible material". Airport firefighters were called in to spray foam typically used in airline crashes on to the flames. Atlanta police told residents not to drive in order to keep roads clear for emergency services. Government offices in Atlanta were set to open late on Friday to give people extra time to travel to work. The interstate is a major thoroughfare in Atlanta, carrying up to 250,000 vehicles per day. It is unclear when it will be reopened.